Well this is a stunner of a quilt, and I want the quilting to match. It truly ended up more than I had envisioned. I sent a quick PM off to Fantastic Feline...then got thinking I probably should open the question up to others too.....hopefully something will ring right here. all the fabrics have a gold metallic in them. I intend to put a wide mitered border that will be the following finished sizes 2in black, 2in white, and 4in black. I want to use a gold metallic thread to quilt it. I really do not want to quilt over the oriental fabric, so basically just want to quilt on the black and white only. Very intriguing quilt! I love how the black looks like it is weaved into the white. I am not an expert on quilting so will leave the opinions up to those who are, but had to comment.....it is a stunner! just quilt echo's of circles or half circles. those always look good. Love your quilt!!! It's gorgeous. Wow, that quilt definitely talks, what a great pattern and beautiful piecing! I know you're not liking the idea of quilting on the prints, but I'm seeing quarter circles (similar to a baptist fan pattern) in the printed circles, stippling (maybe small cherry blossoms) in the white square areas to make the black squares and prints pop, and leave the sashing strips alone. No matter what you decide, this is a stunning quilt and your friend will be ecstatic! I know you don't want to quilt onto the circles, but the first thing I thought of before I even finished reading your post is a chrysanthemum as that is a traditional motif in Asian art. Or how about Koi fish swimming along the solid borders? Love the way you've "woven" the black and white together. Beautiful quilt! I am not an experience enough quilter to give advice but I did like the look in omaluvs2quilt reference. It is a beautiful top with an oriental feel to it. I would look at some Shashiko (sp)patterns to see if you could quilt them into the black and white sections. It really depends on your FMQ skills. Beautiful quilt!! You have to be so proud!!! I will never be able to do something that wonderful!! I have no suggestions for quilting, as all I know is SID or straight lines. That is absolutely gorgeous, but I'm sorry I don't have any quilting recommendations. I am afraid the gold metallic thread quilting would detract or cover up some of the designs in the circles, I fussy cut most of them for the look......sigh, but everything I have seen so far that I like shows something quilted in the center. I did a small lap size sample so I can test out any design before throwing it up on the big one. Oma, I love that quilt, it is so amazing....might actually try that pattern one day. Tartan, I was looking at different sashiko prints, or like artsy recommended the chrysanthemum outline. Just isnt speaking to me...sigh very frustrating for me, because I usually have the quilting picked out prior to the first cut of fabric, but on this one it just escaped me in every stage. There is the original pattern if anyone is interested. Last edited by CarolynMT; 08-03-2013 at 12:08 PM. Congratulation on making such a stunning quilt. My first thought too was to would be to quilt echo's of circles or half circles. I would keep to the same color thread as is the fabric. Stunning. Hope that someone is able to come up with quilting that will not detract from the beauty of this quilt. Sorry no help on the quilting! Sure is beautiful!!!!!!!!! 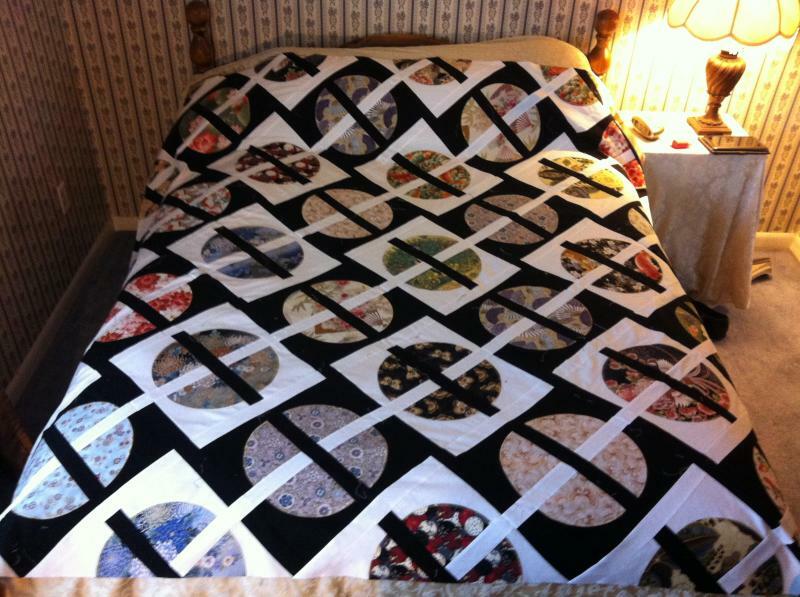 I would think with no quilting in the circles they would be puffy and not lay nicely. I did a Dresden Plate and had to quilting in the center of each flower - it just looked unfinished. It will be interesting to see what you come up with. My first thought was of doing orange peel in the sashing, that is both circular and a traditional Japanese motif. Just "wow" ..... I'm drooling! 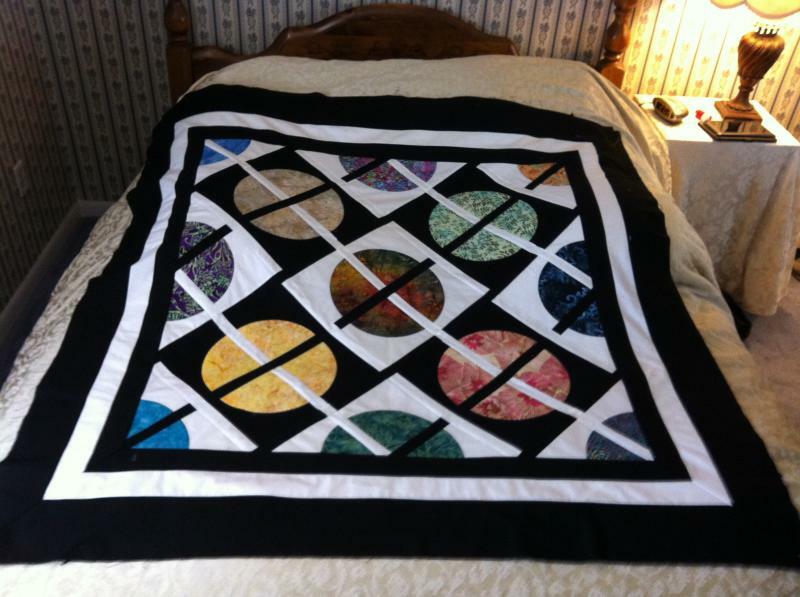 If you don't want to quilt over the colored quarter circles, I would definitely stitch in the ditch along the black and white sashings which go through the circles. Then, if you look at the space between four circles, the space where two white corners and two black corners meet, it is roughly a square shape with curved sides, kind of like the shape of an improved nine patch piece. Maybe you could find a "block" quilting pattern you like to fit into those areas. It would be nice if it were an Asian type of pattern, I think. Thanks for the link...I like yours much better!!! Last edited by omaluvs2quilt; 08-03-2013 at 04:33 PM. Your quilt is spectacular. I believe an ambitious quilting design would really detract from the quilt, and I'm sorry to say I think that includes gold metallic thread with an exception. If it were me, I'd quilt along the sashing SITD with the same color thread on top as the sashing. Then I'd take each quarter circle and do echo quilting of the circle in the same color as the fabric. You could do fancier asian-themed quilting in the borders or circles and x's through them. In my humble opinion, adding a complex quilting design to that quilt will ruin the pattern. At most, in addition to what I've mentioned, I might add two or three straight lines equal distance and coming from the middle of the circle in each quarter, and that could be done as a straight line quilting with gold metallic, but stop at the edge of the circle or maybe go around the very outside of the circle with metallic. Check that last part out on your sample. The quilt is outstanding. Congratulations. I think you could win a ribbon on it if you used the right quilting design. Wow, no clue about the quilting, but I really like Asian fabric and design. Just beautiful. First of all, beautiful quilt! Now to the quilting...... after reading the other posts & going back & studying it again, I don't see using gold thread. I think it will overpower it. What batting are you going to use? Look at the stitch distance for the batting. If you can get away with it, I'd just outline the 1/4 circles. Like you would go around applique. Definitely SITD all of the sashings. In the sashings you could do a small pattern of genko (?) leaves. There I think you could get away with the gold maybe. I think larger leaves in the border would tie it all together. Maybe a light stippling in the black & white area with their respective colors too. I know, a lot of thread changes for each pass, but worth it in the end. I love Asian fabric and have a future quilt in the "bought the fabric, chose the pattern" phase. I love your quilt! Do post when it's quilted. I just wanted to chime in and say how intriguing your quilt is, especially the way it looks like the black is woven in. I'm waiting to see it finished, I'm sure our experts are going to steer you in the right direction. My original thought was just to do a very simple design in gold thread along the sashing strips. Then do a nice border also in the gold. I havent found a good batting yet. the top is very heavy now. I actually have to keep it folded while waiting rather than hung like I do all my other tops because of the weight. I need something that will allow me to stitch up to 6in apart. the circle quarters are only 5ins in diameter, so I could get away with not stitching. I also thought about doing a feather design in that black/white areas, but think everyone is right, the quilting needs to be very simple. No suggestions - just wanted to say it's a beautiful quilt!